Myanmar’s exquisite temples might hold pride of place in the heart of this mesmerising country, however Mother Nature’s awe-inspiring power has carved out a few spectacles of her own. Take to the waters of the Irrawaddy in unprecedented luxury, as you journey from Magwe to Mandalay. The majestic Inle Lake reveals the ancient practice of one-legged rowing, perfected over centuries. Settle into your hotel in Yangon for a two night Special Stay. Enjoy your welcome dinner at the iconic colonial Strand Hotel. 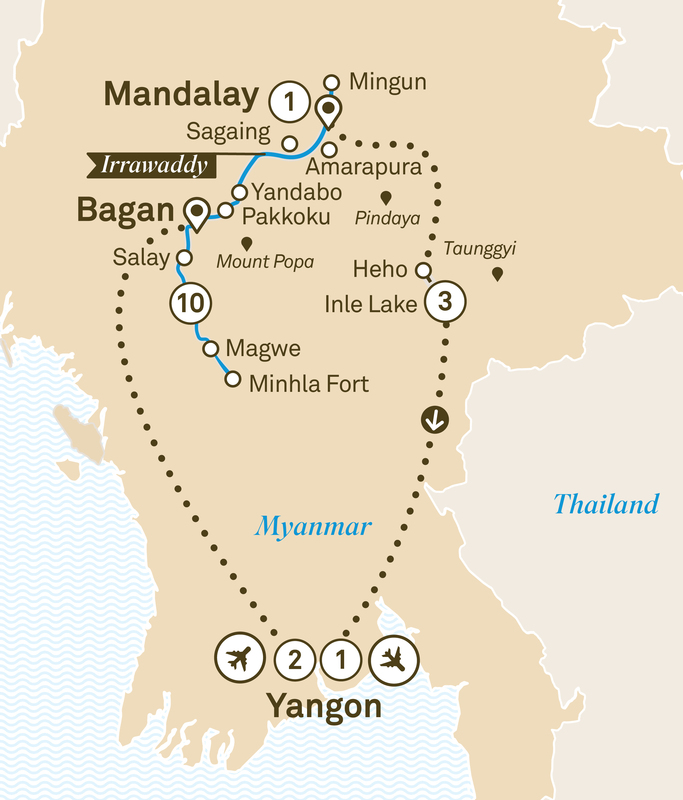 Embark a local train for a ride around Yangon’s suburbs. Alternatively, be guided on a tour of Yangon’s thriving art scene, or ride a ferry across the Yangon River to Dhala village. Later this afternoon visit Chaukhtatgyi Paya, Yangon’s reclining Buddha. As the sun is setting, wander around Shwedagon Pagoda and learn about the ritual of oil lamp lighting before partaking in this tradition. This evening enjoy the included amenities of your Pacific Club access. Fly to Bagan. On arrival, enjoy a local lunch before visiting the Ananda Temple. Afterwards transfer to the luxurious Scenic Aura. Today, take advantage of nearly a full day of cruising as you sail to Magwe. Spend the day relaxing and getting to know the facilities of Scenic Aura. Late this afternoon arrive in Magwe for the night. Explore Magwe by traditional trishaw and take in the views from Mya Tha Lun Pagoda, a mesmerising architectural vision set on Naguttama Hill. Continue cruising downstream to the Italian built Minhla Fort where its capture by the British brought to an end to an independent Burma. Afterwards sail back upstream towards Salay. Make use of the ship’s luxury and take the time to sip a cocktail by the pool or enjoy some solitude on your private balcony during your full day sailing upstream along the Irrawaddy to Salay. Arrive late in the afternoon to spend the night alongside this colonial riverside town. On your morning walking tour of Salay admire the colonial buildings, the Youqson Kyaung, a beautiful teak monastery now converted to a museum and look inside the largest lacquer Buddha in Myanmar. Soak up the ambience of the river and the colonial feel of the town whilst enjoying traditional local Burmese tea and snacks in a restored colonial villa dating from 1906. Continue sailing to Bagan. Relax on the Sun Deck with a cocktail in hand viewing the many temples and pagodas that line the river as you approach the ancient location. Venture to Mount Popa, home to Myanmar’s nats or nature spirits, or cross the river to Tant Kyi Tuang to take in the expansive elevated views of Bagan. Alternatively, wander through the markets at Nyaung U before either exploring the Temple Circuit, or enjoying a visit to Old Bagan. Then be wowed by a Scenic exclusive magical themed dinner, with included free flow drinks and cultural show in front of candle lit Bagan temple ruins. Between 01 October and 31 March, take a chance to ride in a hot air balloon flight over the majestic temples of Bagan. Must be purchased prior to your cruise to guarantee availability. Travel by horse and cart through Bagan plain and it’s temple ruins before learning all about the production of Burmese lacquerware, a Bagan specialty. Depart Bagan and sail to Pakkoku for an overnight visit. Here visit a cheroot cigar workshop, the local market and longyi and blanket factory. Arrive in Yandabo where in 1826, the peace treaty ending the First Anglo-Burmese war was signed. Now famous for its pottery, stroll through the village and witness the artisans honing their craft. Continue sailing to Mingun. Cruise to Mingun to discover the stories behind a huge unfinished brick pagoda. Nearby, admire the un-cracked Mingun Bell and the all-white Hsinbyume Pagoda. In Sagaing interact with novice monks, nuns and orphans during a special visit to a monastic supported school before continuing to a quiet nunnery where you will partake in the ritual and our donation to the resident nuns before their midday meal. Also take in the views over the Irrawaddy River from Sagaing Hill before sailing to Mandalay to visit Amarapura. In Amarapura, relax with evening drinks in boats under U-Bein Bridge, to capture that memorable photo of the bridge’s silhouette at sunset. Back on board enjoy the special farewell by Scenic Aura’s crew. Admire the intricate artistry of Shwenandaw, a beautiful wooden monastery and Kuthodaw Pagoda, home to the ‘World’s Largest Book’. Later walk through the rebuilt Mandalay Palace. Learn how to produce gold leaf. At Mahamuni Pagoda, male guests will be able to place the gold leaf on the iconic Buddha statue. Fly to Heho and drive to Nyaung Shwe. Glide across the waters of Inle Lake towards your award winning resort for a three night Special Stay. Cruise to Inle Lake’s moving market. Then, visit Phuang Daw Oo Pagoda, one of the region’s holiest sites. Learn about life at home on the lake with a visit to a local Intha family for your lunch. Later visit a Pa-Oh village. Visit Pindaya Caves, or visit Taunggyi for lunch at Myanmar’s oldest winery. Alternatively, walk to a nearby village. Enjoy evening drinks and share today’s tales of exploration. Fly to Yangon for lunch at the historical House of Memories Restaurant. On this 11 day Luxury Irrawaddy river cruise from Yangon to Mandalay, enjoy drinks at U-Bein Bridge, partake in morning alms and venture to Mount Popa.